It is well established that all PKC isoforms except the two atypical isoforms (l and Z) require phosphatidylserine and DAG for optimal enzyme activity (Nishizuka 1995; Bataini and Mochly-Rosen 2007). The finding that PKC has strict stereospecific requirements for both of these membrane-resident lipids suggests that the lipids interact stereospecifically within binding pockets on the enzyme. Phosphatidyl-L-serine is greatly preferred over its enantiomer phosphatidyl-D-serine (Newton and Keranen 1994), but a high degree of cooperativity in the response to this phospholipid has made it difficult to define a single site of interaction with PKC. 1,2-Diacylglycerols bind to one or both of the C1 domains (C1a or C1b), whereas the enantiomeric 2,3-diacylglycerols do not bind or activate (Sreekumar et al. 1997), nor do the isomeric 1,3-diacylglycerols. Among the C1a/b-containing PKC iso-forms, substantial variation exists in terms of the affinity for DAG as well as C1a/ C1b subdomain interactions. For example, the affinity of C1 for DAG in the conventional PKC isoforms is relatively low, but together with Ca2+ bridging between C2 domains and membrane phosphatidylserine, these interactions are adequate to ensure selective lipid targeting as well as relatively long duration anchoring to membranes (Corbin et al. 2007; Oancea and Meyer 1998). The novel PKC isoforms that lack a Ca2+-binding C2 domain display a much higher affinity for DAG, a difference that can be traced to a single amino acid change in the binding pocket (Dries et al. 2007). This high-affinity interaction with DAG effectively increases the residence time for activated PKC once it binds to a target membrane. This difference in the C1 lipid binding domain may play a key role in anchoring certain PKC isoforms to DAG-rich subcellular compartments such as the Golgi (Giorione et al. 2006). The importance of Ca2+, DAG and negatively charged phospholipids for subcellular targeting of PKC isoforms should not be underestimated. Localized and transient elevations of DAG are produced by a variety of phospholipase C isoforms with considerable diversity in their regulatory properties (Drin and Scarlata 2007). Similarly, a variety of mechanisms are known for producing localized and transient Ca2+ elevation. Phosphatidylserine may not change rapidly in response to environmental cues, but the DAG precursor phosphatidylinositol-4,5-bisphosphate (PIP2) does undergo rapid and transient changes that can dynamically influence PKC targeting. The potential for complex isoform-specific control of PKC activity at a membrane surface is substantial without the need to invoke scaffolding proteins. Moreover, other lipids such as ds-unsaturated fatty acids, lysophospholipids, ceramide and phospha-tidic acid are known to influence PKC activity with some preference for certain iso-forms over others (Huang et al. 1997; Pi and Walker 2000). Studies of defined lipid mixtures using physico-chemical methods have revealed that the physical properties of membranes have a large impact on PKC function (Jimenez-Monreal et al. 1999). Membrane curvature, head-group spacing, head-group hydration, acyl chain fluidity and the presence of non-bilayer structures such as hexagonal phases have all been correlated with PKC activity (Dibble et al. 1996; Sando and Chertihin 1996; Corbin et al. 2007; Escriba et al. 2007; Jimenez-Monreal et al. 1999). A common feature of these physical characteristics of lipids targeted by PKC (small head groups such as DAG, high membrane curvature as in small vesicles, and bulky unsaturated acyl chains) is crowding of acyl chains within the hydrophobic core of the bilayer. An intriguing hypothesis is that such lateral crowding forces can cause local "splaying" of membrane lipids such that individual acyl chains are squeezed out of the bilayer (Escriba et al. 2007). This unusual hypothetical structure featuring acyl chains protruding away from the membrane surface could then be stabilized by acyl chain-binding proteins such as PKC. This kind of correlation between physical properties of membranes and membrane protein activity is not unique to PKC, but is common among enzymes that function at the 2D boundary between the cell membrane and aqueous cytosol (Hurley 2006), such as phospholipases (Drin and Scarlata 2007) and proteins involved in membrane fission/fusion (Adreeva et al. 2006). Lipid heterogeneity within cell membranes is well documented with the inner leaflet known to contain regions with a high level of phosphatidylserine, PIP2 or DAG (Escriba et al. 2007). With their unique physical properties such as high charge density, divalent cation binding and a tendency to form non-bilayer structures, such lipid mixtures could play a major role in PKC targeting and subsequent substrate phosphorylation, even if such lipids come together only transiently. Lipid rafts are cell membrane subdomains containing a unique combination of lipids such as cholesterol and sphingolipids, often stabilized by specific proteins (Michel and Backovic 2007). Caveolae represent one type of lipid raft characterized microscopically as cell surface invaginations and biochemically as detergent insoluble membrane microdomains rich in the small oligomeric scaffolding protein caveolin (Couet et al. 1997a,b; see also Patel et al., this volume). 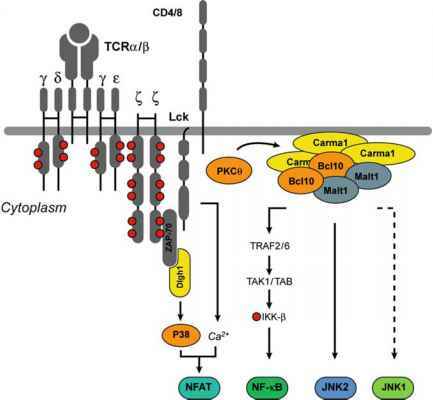 Caveolae may play a role in transcytosis across epithelial cell barriers, endocytotic recycling of surface molecules or organization of signaling pathways (Michel and Backovic 2007). PKC isoforms have been shown to interact reversibly with cave-olae in cardiac myocytes and to stimulate phosphorylation of other signaling molecules in the vicinity (Rybin et al. 1999), but it remains unclear how the lipid requirements for PKC activity are met in this environment. The more traditional view is that signaling proteins [e.g., kinases, G-protein coupled receptors (GPCRs)] are inactive when associated with caveolae (Couet, et al. 1997b). Small peptide sequence motifs that mediate interactions between caveolin and PKC isoforms have been described (Couet et al. 1997a). Other lipid rafts rich in PIP2 and phosphatidyinositol-3,4,5-trisphosphate (PIP3) have been suggested to play a key role in establishing cell polarity in conjunction with aPKCZ and PI3-kinase/ PTEN (the kinase and phosphatase that interconvert these polyphosphoinositides) (Comer and Parent 2007), although membrane proteins almost certainly play a role (see below).